In The Three Duties of Nonprofit Board Members, Part 1, I began a discussion of the duties of care, loyalty, and obedience. Having already covered duty of care, this post addresses the second of these, the duty of loyalty. The duty of loyalty is simply a standard of faithfulness to the nonprofit corporation you have agreed to serve. It is important to remember that a nonprofit corporation belongs to the community. You have only been granted stewardship of its growth and management so that it can realize its mission. The community at large will always hold you accountable to that end. As a board member you must always give your undivided allegiance when making decisions affecting the organization. You may never use information obtained as a board member for personal gain and must always act in the best interest of the organization. Does this mean that a conflict of interest will never arise? Of course not. For this reason, it is imperative that an organization have a conflict of interest policy in place to address molehills before they become mountains. Let’s look at two examples on opposite ends of a spectrum of conflict of interest and your undivided allegiance to an organization. On one end, if you learn in a Little League board meeting that the ball club is looking at a piece of property to purchase for game fields, you would never run out to purchase that property and flip it for a profit by selling it to the club. We don’t try to recruit Little League volunteers at the Girl Scout meeting, we don’t take the Girl Scout cookie order form to the Band Boosters meeting, and we don’t sell Band Boosters raffle tickets at the Little League meeting! When you are in the room for Little League–you are in the room for Little League. Period. Duty of Loyalty. It is not unusual or prohibited for conflicts of interest to exist as long as they are known to and considered appropriate by the board of directors. Beware of even the perception of a conflict of interest and handle appropriately. Never use information gained through board service for personal gain. 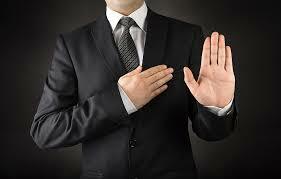 The duty of loyalty includes confidentiality of board matters. Protect yourself and your organization by insisting that a conflict of interest policy be written and periodically reviewed and updated. Most organizations carry Directors and Officers Liability Insurance to help protect you from personal liability regarding your board service; however, no amount of insurance can protect your reputation. Your duty of loyalty is an important component of achieving success for the organization and a rewarding experience for yourself.